Chateau Bergat in St. Emilion is an obscure classified growth that is located very close to Chateau Pavie Macquin and not too far from the village of St. Emilion. The estate is owned as a joint venture between the Casteja family and the Preben Hansen family. The Casteja family also count among their holdings in Bordeaux, Chateau Trotte Vieille in Saint Emilion, Chateau Lynch-Moussas and Chateau Batailley in Pauillac, as well as a large, Bordeaux wine negociant company. The 3.5 hectare Bordeaux vineyard of Chateau Bergat is situated on a terroir of limestone, clay and iron. The St. Emilion vineyard of Chateau Bergat are planted with 50% Merlot, 40% Cabernet Franc and 10% Cabernet-Sauvignon. The wine is fermented in stainless steel vats and aged in approximately 50% new French oak for up to 18 months. The property produces about 1,000 cases of Chateau Bergat per year. Chateau Bergat is best served at 15.5 degrees Celsius, 60 degrees Fahrenheit. The cool, almost cellar temperature gives the wine more freshness and lift. Young vintages can be decanted for up to 1 hour. This allows the wine to soften and open its perfume. Older vintages might need very little decanting, just enough to remove the sediment. Chateau Bergat is best paired with all types of classic meat dishes, veal, pork, beef, lamb, duck, game, roast chicken, roasted, braised and grilled dishes. Chateau Bergat is also good when matched with Asian dishes, rich fish courses like tuna, mushrooms and pasta. Following the results of the 2012 St. Emilion Classification, Chateau Bergat was merged into the Casteja families other St. Emilion estate, Chateau Trotte Vieille. 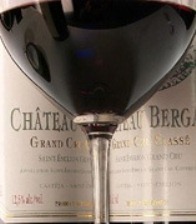 2011 is the final vintage of Chateau Bergat.